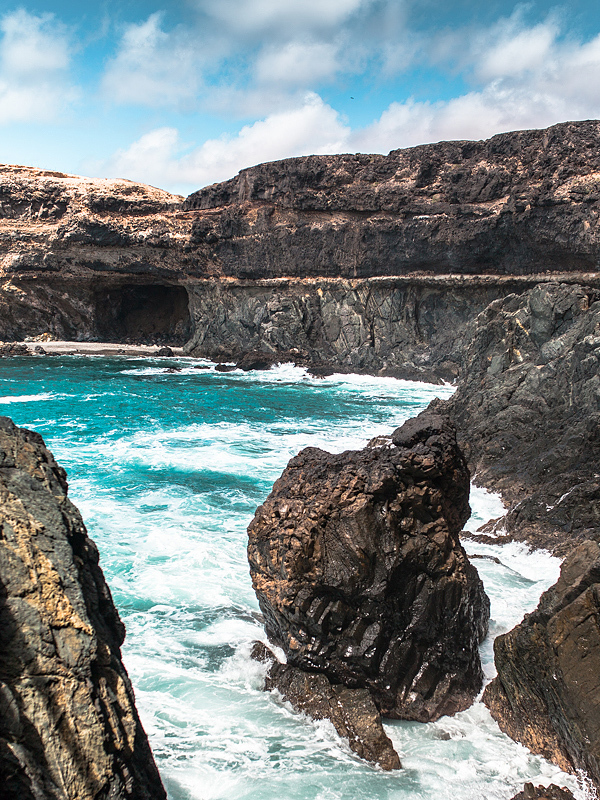 Let’s move on with great impressions and travelling tips for Fuerteventura; this time we discovered the west coast and the beautiful little hamlets Cofete and Ajuy. For a relaxing finish I have some last words about Morro Jable for you. For our third day of travelling by car there were only two destinations on our list. As we had only until late afternoon to return our rental car we wanted to take it easy that day. 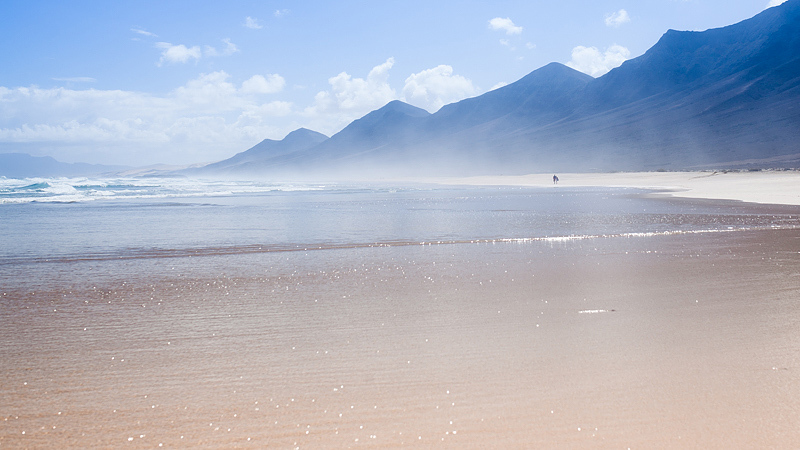 This day was dedicated to Fuerteventura’s west coast. 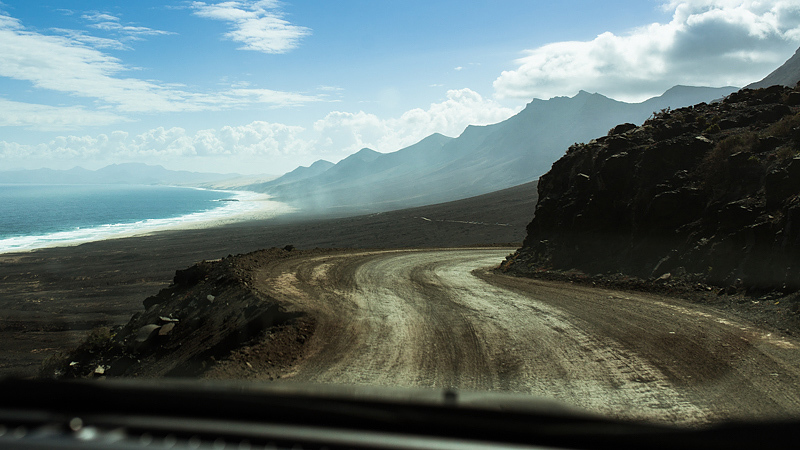 On a dirt road to Cofete? From the beginning on Cofete was the destination we were looking forward to the most. 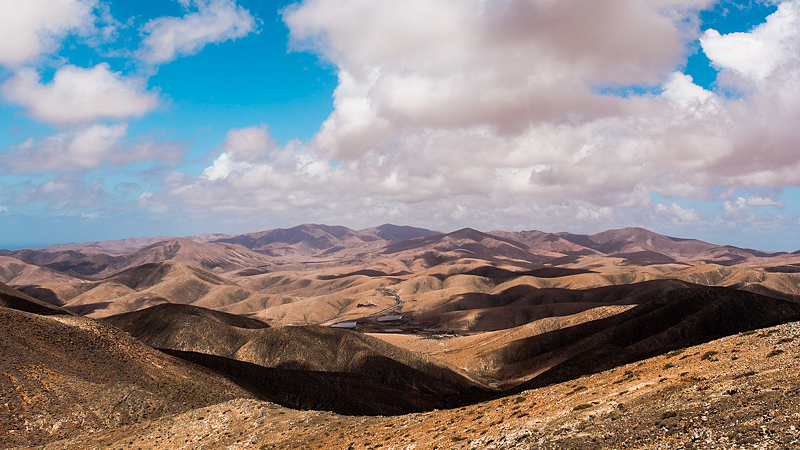 According to our travel guide Cofete is a must-see in Fuerteventura. There’s only one road leading to Cofete. Concrete soon turns into a sandy and rocky path meandering along the edge of Fuerteventura’s highest massiv leading you after 1 hour of driving (for about 15 km) to one of the loneliest, inhabited places I’ve ever visited. Cofete is a hamlet with 15 inhabitants and a few more goats. In Cofete there are no hotels, pensions and no stores. There’s not even a little snack bar at the beach. The only tavern, a restaurant at the same time, is powered by a lonely, little windmill. Slightly above the city there is the “Villa Winter” an unfinished shell construction of a Nazi officer, which today is inhabited by goat farmers. 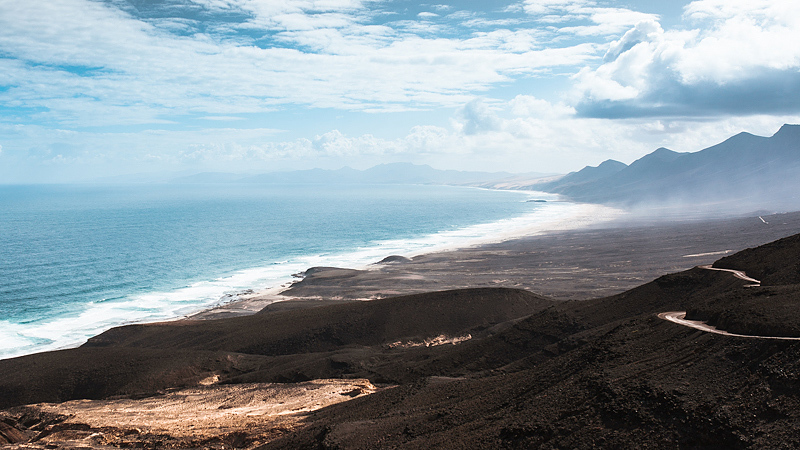 To one side Cofete is surrounded by the 800 meters high Jandía massif, on the other side you can see kilometers of white beach. 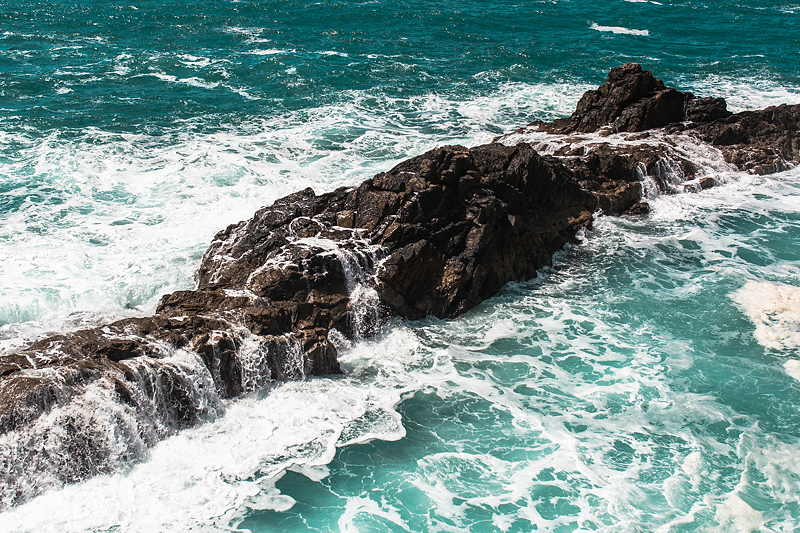 The sea is wild and beautiful. The metres-high waves are actually self-explanatory for the danger you get yourself into if you dare to go deeper into the water than your ankles (nevertheless there’s several casualties every year because reckless tourists think they know better). In this place time seems to have stopped. 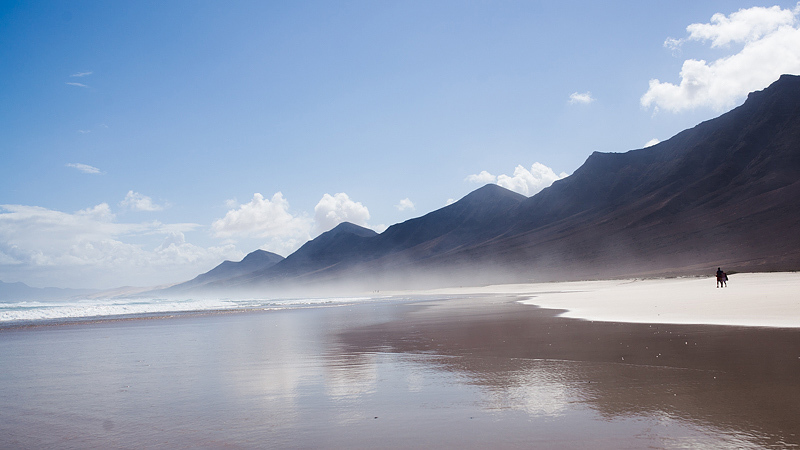 If you like total calmness or are on a self-discovery trip you should spend a day at the beach of Cofete. Even though there are guided tourist tours you still feel isolated and other-worldly. If you plan visiting Cofete you should consider renting an offroad-vehicle. Admittedly, from travel reports we expected worse street conditions and were a bit confused about the recommendation to rent an offroad-car. But in retrospect it was a good decision to invest in our Jeep Cherokee as we had a great driving experience and a good sense of security. I would not recommend to drive to Cofete with an old or under-performing car. The fact is that neither normal nor offroad vehicles are covered in the insurance of any car rental for the road to Cofete. So drive careful and cautious and be considerate of other drivers. Let locals who know the streets better pass – simply be no assholes and you should be fine. After this wonderful trip to Cofete we continued with another highlight of the west coast. If you asked me with place I prefer, Cofete or Ajuy, I could give no definite answer. Both, Cofete and Ajuy are lovely and have their own, unique beauty. 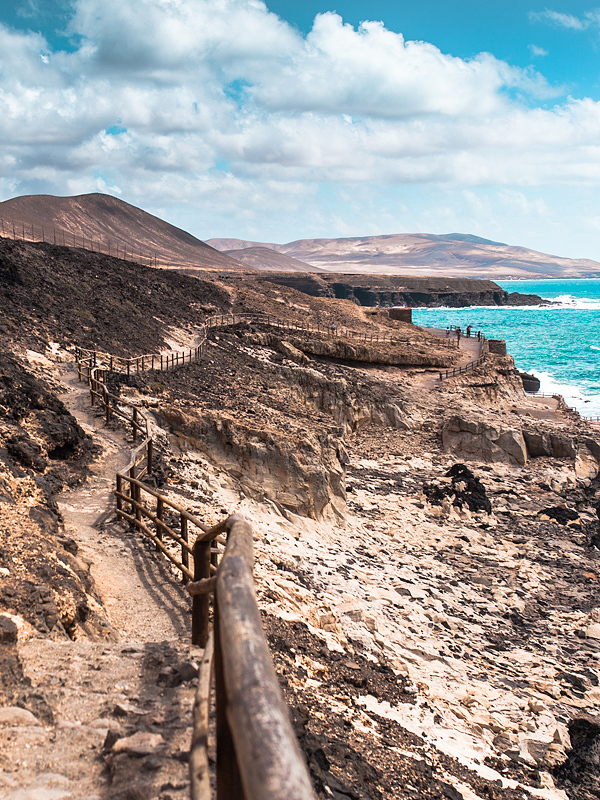 You shouldn’t miss any of those if you visit Fuerteventura. Ajuy is an old fishermen’s village with some more inhabitants than Cofete (around 90 if you believe Wikipedia) and a steady flow of tourists who probably are the reason why there is a good variety of restaurants (with ocean view). 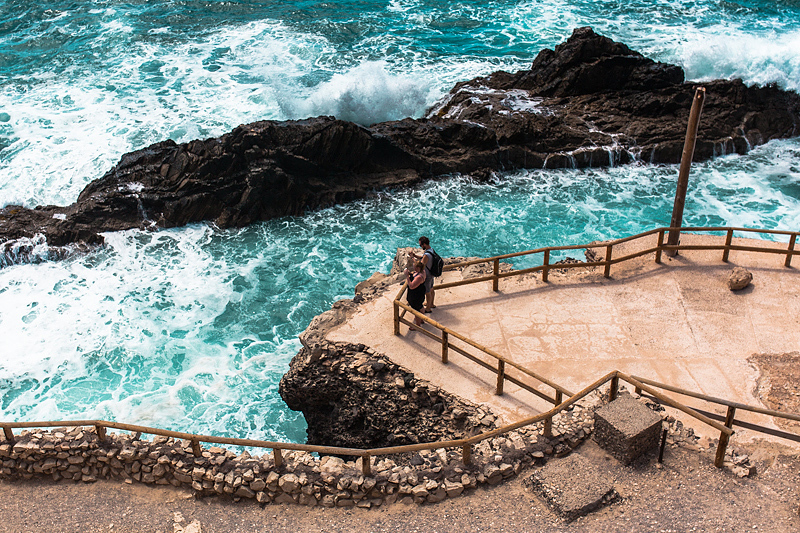 There are many reasons why you should visit Ajuy. Firstly there’s of course this charming hamlet with white houses and restaurants. Secondly the black beach adjoining to the village looks amazing. And lastly there are those amazing cliffs and caves which were formed by the rough west coast over the time. 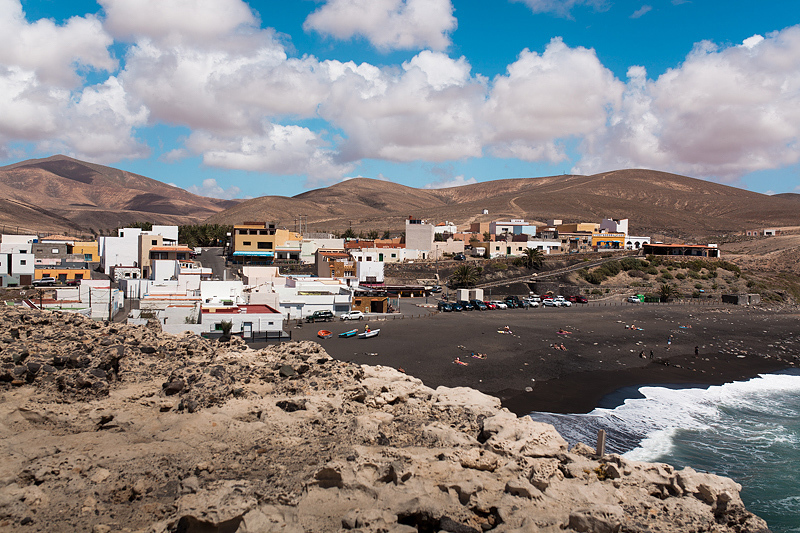 To the right of the black beach there’s a path which leads you from a white rock plateau, along an old lime kiln unti you reach the “Caleta Negra”, the black bay. (the path is rather negotioable so even people suffering from back or knee pain can walk there. Just the stair down to the cave is quite steep and not suitable for everyone). The black bay consists of many caves and bluff rock walls, which make an imposing sight. By some steep stairs you can even get into one of those caves. My brother and I of course had to go there and take look. The current in Ajuy is, as in Cofete, strong and the waves are high. It’s a great natural spectable which you should marvel at from a distance. I personally could watch the waves covering the rocks, retreating and then coming back again with an immense force for hours. Terrific! My family and I were in complete agreement that Ajuy and Cofete were the absolute highlights of our vacation. 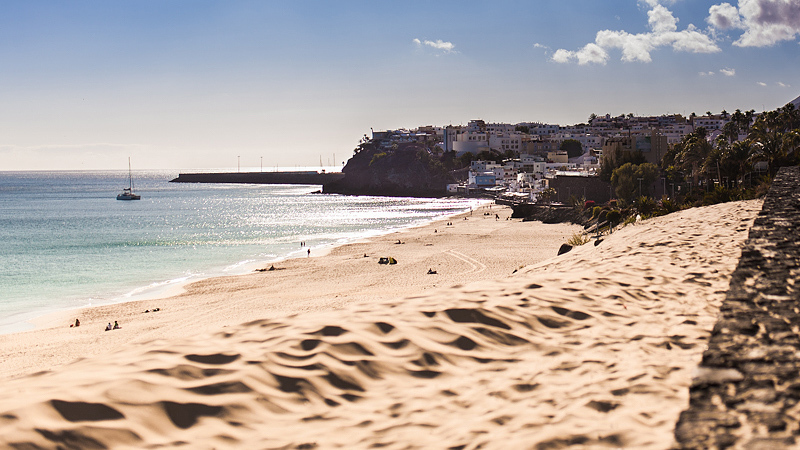 After so many exciting destinations for day-trippers there’s just one thing missing. The final relaxation. We resided in a very nice hotel during this week. 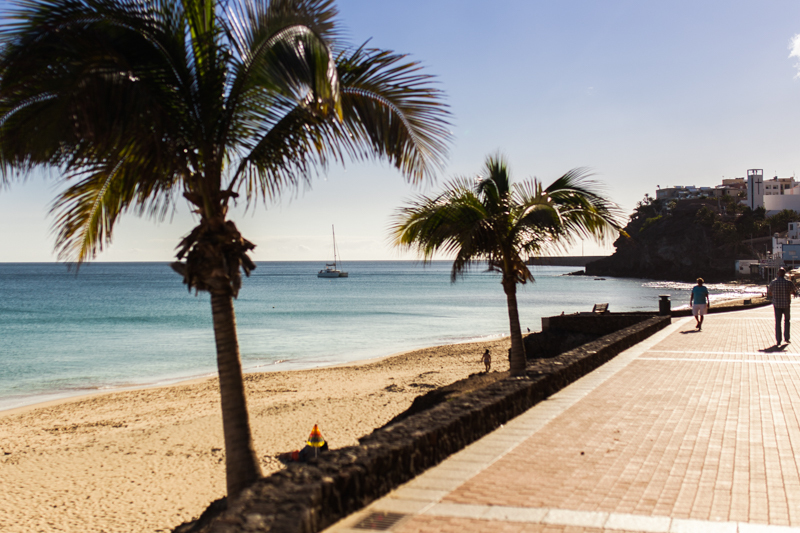 It’s located in the south of the Island, on the peninsula Jandía, only 20 minutes of walking distance from Morro Jable. 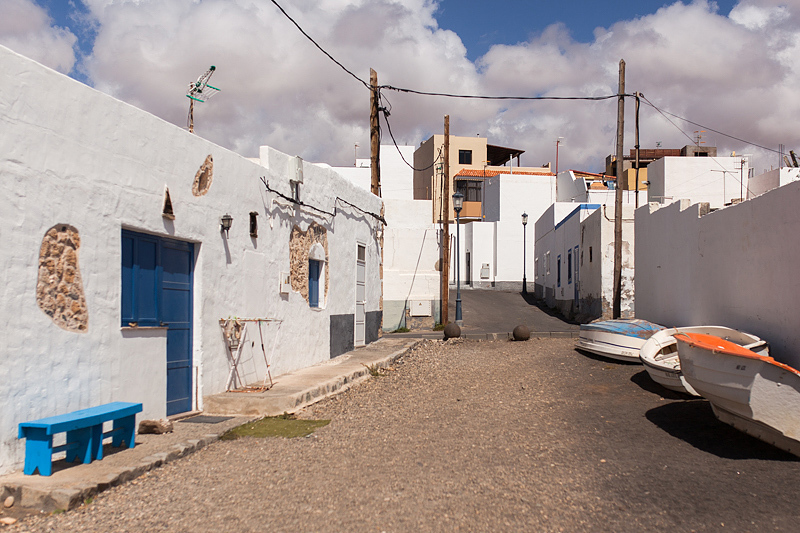 Morro Jable is a former fishermen’s village and could obtain lots of its charm. 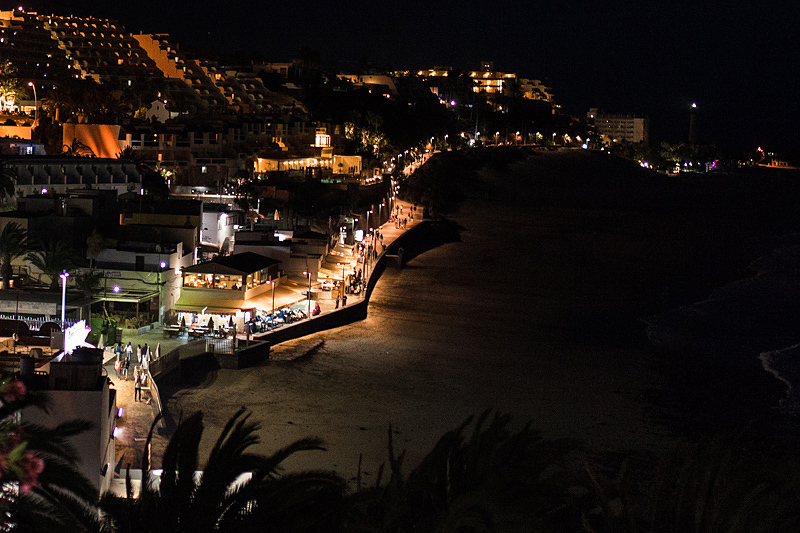 We spend one evening and one afternoon in this village and were rather impressed by the range of great (fish)restaurants from which many even offered an ocean view and therefore provided the perfect vacation feeling. The way there along the beach promenade is very pretty with white beaches, palm trees and colourful flowers by the wayside. Morro Jable itself provides an excellent view of this way once you climbed the stairs up to the view point at the church. When you stroll along the narrow alleys, you can hear spanish chatter all around you, which we liked a lot. 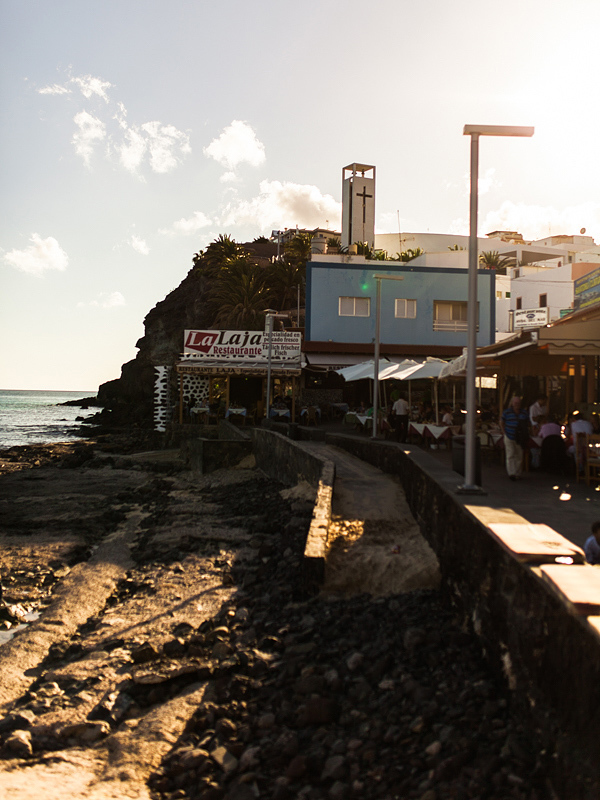 Even though Morro Jable is a place loved by the tourists you still meet many locals and you don’t feel overrun by tourists or overpriced tourist articles. Apart from that the Spaniards are incredibly cheerful, open-minded, jovial people, which I valued back in Madrid and Barcelona already. You are welcomed everywhere with an honest smile and treated like a friend rather than a tourist or stranger. 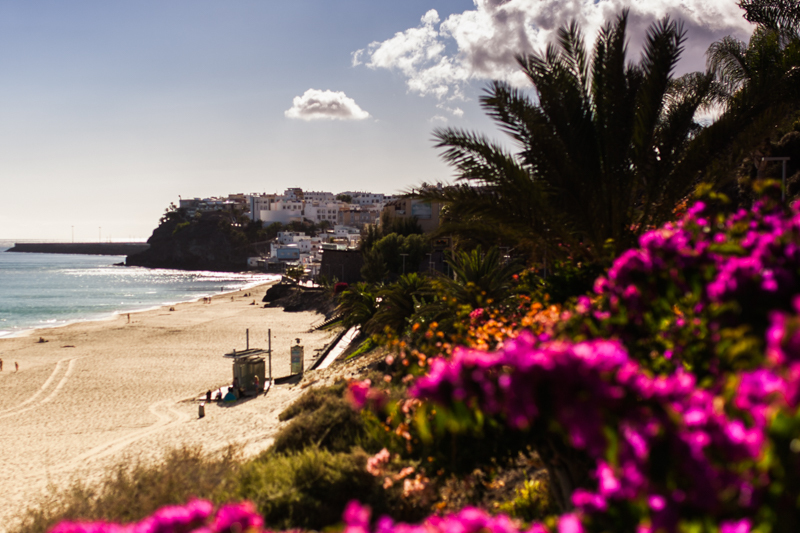 This is a quality you can’t compensate with money and this is also the reason why I regularly decide to go back on a vacation to spain 🙂 The Canary Islands definitely made it’s way onto my Travel-Wishlist, which is, I admit, already quite extensive. 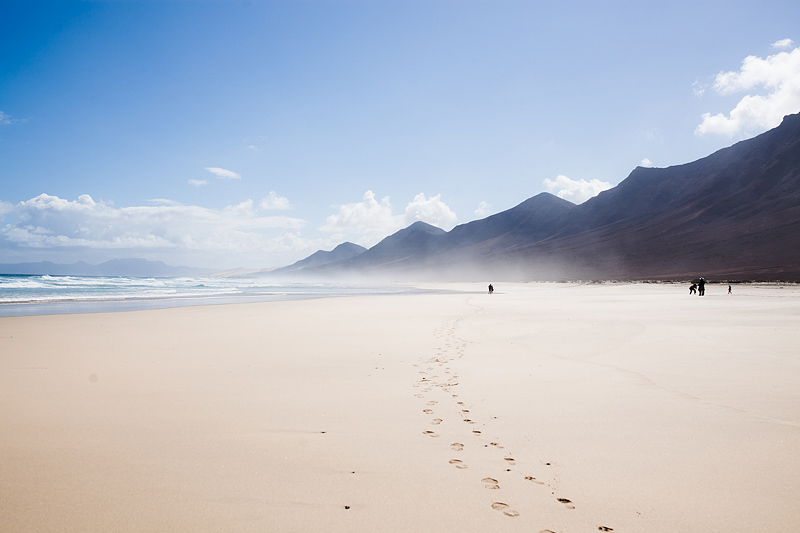 Thank you Fuerteventura for those marvellous experiences!